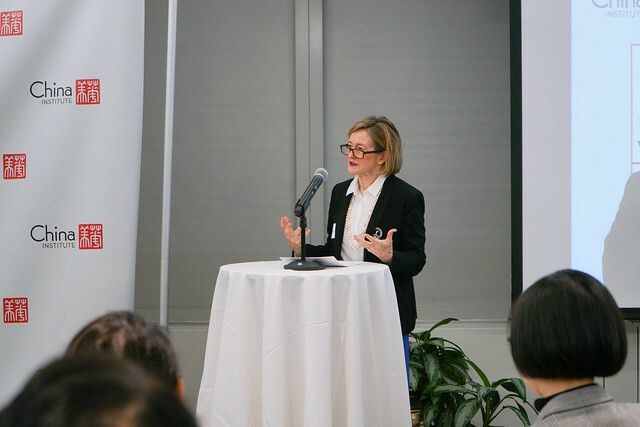 “The Next U.S.-China Frontier: Technology, Disruption and Social Innovation” was held on April 11, 2019. Explore the playlist featuring the full recording of opening remarks, panel discussions and dialogues. Browse the Summit agenda (all subject to change) and speakers below. 1:45-2:45 PM Panel One: U.S.-China Competition and Collaboration: Can we afford to live apart? Will Shenzhen Be the Next Silicon Valley? 4:15-5:00 PM Panel Three: Future Cities, Future Mobility: Where is the next new technology? David Ai is Chief Innovation Officer and Director of Tech Transfer at the University of Hawaii. Previously, he served a similar function at the City University of Hong Kong (4 years) and Stanford University (6 years). Previously, he was Chief Advisor at Hitachi Corporate VC until 2006, where he scored several successful exits. Earlier, he founded an award-winning e-healthcare in Beijing. He also secured $6M VC investment in a cancer center in Shanghai. He was VP/GM at Varian (NYSE: VAR) in 1990s. With an MS (computer science, IndianaU), an MBA (Stanford), and a J.D. (Santa Clara University; patent attorney California). Mr.Bao has more than 15 years of executive management experience in R&D , Innovation Incubation and Investment in China’s technology sector .Mr.Bao founded the True Digital Foundation located in Zug , Swiss which develop the blockchain based on “Self sovereign and Self regulated” idea to improve the conventional centralized regulation system and build better future digital economy. Mr.Bao is the member of several international and domestic organizations like Digital Economy Task Force of UN ESCAP , the European Networks of Living Labs under Research DG of EU commission and Mahong Think Tank. Mr.Bao graduated from Xi’an Jiaotong University and got a MBA degree in Fiance at Cheung Kong Graduate School of Business. He is the president of Xi’an Jiaotong University Electrical Engineering Alumni Association Shenzhen branch. David Chen co-founded AngelVest Group (angelvestgroup.com), an investment interest group helping individual angel investors identify and invest in early stage companies in Greater China. AngelVest Group has grown to be one of the largest organized angel groups in Greater China comprised of mostly expats with around 70 members in Beijing, Shanghai, Hong Kong, and Singapore. Mr. Chen has taken CFO duties and Board member of Hanson Robotics since its Series A financing – the world’s leading company in producing human-like robots with artificial intelligence technology, makers of the famous “Sophia” robot. Mr. Chen earned his BS in Electrical Engineering from the University of Rochester and MBA from Harvard Business School, and studied Chinese at Peking University. Originally from New York, Mr. Chen has been living in Shanghai for the last 12 years. Susan Yuqing Feng is the U.S. News Chief at Yicai Global. During her tenure, Susan interviewed Warren Buffet, Alan Greenspan, President Clinton, Zbigniew Brzeziński, Thomas Friedman and many other world economic and political leaders. Susan also organized and moderated CBN New York forum with distinguished speakers every year since 2009. Wenfeng Liu joined iQIYI in 2012 and currently serves as Chief Technology Officer. He is in charge of iQIYI’s technology research and development, IT infrastructure and operation, product development and engineering, as well as product marketing and business development. He led the technical team who build a robust technology platform utilizing cutting-edge technologies, including cloud computing, AI, big data analytics to drive entertainment and product innovations for iQIYI users. Prior to joining iQIYI, Mr. Liu served as research and development manager from 2011 to 2012 at VMware China Research Center, where he led the research, development and distribution of various update and maintenance releases of VMware vSphere products. From 2003 to 2011, Mr. Liu served in various senior positions at Intel China Research Center, including the role of research and development manager between 2007 to 2011, in which position he spearheaded Intel’s various global R&D initiatives. Mr. Liu holds a bachelor’s degree and a master’s degree in computer science from Zhejiang University. Vincent Tianquan Mo is the Founder and Chairman of Fang Holdings LTD. He started Fang Holdings Ltd as SouFun Holdings Ltd. in 1999 and has grown the company, listed on the New York Stock Exchange, to be the largest real estate information provider in China with operation in more than 600 cities. Prior to founding Fang Holdings Ltd., Mr. Mo was executive vice president of ADF. He also worked as an executive for Teleres, a venture of Dow Jones & Co. and AEGON US that provides online commercial real estate information services. Mr. Mo serves as Secretary General of the China Real Estate Index System. Mr. Mo holds a Bachelor’s degree in Engineering from South China University of Technology, a Master of Science degree in Business Administration from Tsinghua University and a Master of Arts degree and Ph.D candidate in Economics from Indiana University. Sean O’Sullivan is managing partner of SOSV, the world-leading “Accelerator VC”. SOSV invests $50 million per year and backs more than 150 new startups annually through its accelerators. Recognized in 2017 as the world’s #1 most active global early stage investor and the #2 most active global seed investor, SOSV is also the #1 most active investor in hardware and life sciences, helping startups get further and go faster. Gary Rieschel has over twenty-five years of successful operating and investing experience as a senior executive, entrepreneur, investor, and global business strategist. During his career, Mr. Rieschel held executive positions at Intel, Sequent Computer, Cisco Systems, and Softbank Corporation. He is Founding Managing Partner of Qiming, a firm with over $4B USD focused on early stage investments in China which is one of China’s premier VC firms. Qiming launched a U.S.-based health care fund in 2017. Slava Rubin is Co-founder of humbition, an early-stage operators fund built by founders, for founders. Slava also founded Indiegogo, a company dedicated to empowering people from all over the world to make their ideas a reality. As CEO for over 8 years from launch in 2008, Slava grew Indiegogo from an idea to over 500,000 campaigns and more than $1B distributed around the world. Prior to Indiegogo, Slava was a strategy consultant working on behalf of clients such as MasterCard and FedEx for over a decade. He is also the founder of “Music Against Myeloma,” an annual charity event that raises funds and awareness for cancer research in partnership with the International Myeloma Foundation. Slava is a graduate of The Wharton School at the University of Pennsylvania. He is also currently a member of the board for Indiegogo and Watsco. Julia Steyn is the founder and former CEO of Maven, the shared mobility marketplace owned by General Motors. Maven focuses on providing members on-demand access to shared vehicles for both personal and professional use, as well as allowing users to share peer owned vehicles on the platform. The Maven start-up was founded in 2016 and grew to approximately $100 million in revenue, 250 employees and 20 locations worldwide. Julia has a passion for innovation and transforming established companies to match the needs of an evolving world. Jeremie O. Waterman is president of the China Center and vice president for Greater China at the U.S. Chamber of Commerce. Waterman is responsible for developing and executing Chamber policy initiatives in China, Hong Kong, Taiwan, and Mongolia as well as steering the Chamber’s policy work in the Asia-Pacific region. In carrying out the Chamber’s Greater China agenda, Waterman directs its trade and investment policy advocacy and initiatives in the areas of investment, innovation, intellectual property rights, financial services, agriculture, health care, energy and environment, and corporate governance and social responsibility. Waterman has pioneered a number of Chamber business initiatives focused on China, such as the U.S.-China CEO Dialogue and the newly created China Center. Jeannette M. Wing is Avanessians Director of the Data Science Institute and Professor of Computer Science at Columbia University. From 2013 to 2017, she was a Corporate Vice President of Microsoft Research. She is Consulting Professor of Computer Science at Carnegie Mellon where she twice served as the Head of the Computer Science Department and had been on the faculty since 1985. From 2007-2010 she was the Assistant Director of the Computer and Information Science and Engineering Directorate at the National Science Foundation. Professor Wing’s current interests are in the foundations of security and privacy, with a new focus on trustworthy AI. She was or is on the editorial board of twelve journals, including the Journal of the ACM and Communications of the ACM. She received the CRA Distinguished Service Award in 2011 and the ACM Distinguished Service Award in 2014. She is a Fellow of the American Academy of Arts and Sciences, American Association for the Advancement of Science, the Association for Computing Machinery (ACM), and the Institute of Electrical and Electronic Engineers (IEEE). Xiaochen Zhang leads the design and implementation of FinTech4Goods’s strategy which aims to introduce impactful fintech and blockchain solutions to frontier markets through incubation, acceleration and investment. He is a partner at Wemerge Capital, a Chairman of the Global Digital Economy Leadership Council, and serves on the Crowdfunding Professional Association Board of Director, member of the UN ESCAP Digital Economy Task Force and Green Business Task Force. He is also the founder of Blockchain Frontier Group, a co-chair of several blockchain labs, advisor of some leading blockchain start-ups, and a producer and host of the FinTech in China show and Blockchain Million Show. Prior to FinTech4Good, Zhang advised government agencies and multinational organizations on innovative finance, emerging technologies, and investment in positions at the World Bank, United Nations, and other international partnership platforms. He also taught entrepreneurship, innovative finance and blockchain courses at leading business schools. China Institute thanks our presenting sponsor Citi, Wanxiang America, and United Airlines for their generous sponsorship of the 2019 Executive Summit. To enter the building, guests must be on our list and must present a valid ID to receive a visitor’s pass. See details about our 2018 Executive Summit.